Chris Funkhouser working with the Mathews tapes. Photo by Anna Baechtold. Teaching a course at University of Pennsylvania in fall 2010, I made weekly pilgrimages to the Van Pelt-Dietrich Library Center. Early on, I met John Pollack, public services specialist of the Rare Book and Manuscript Library (housed at Van Pelt), who cordially welcomed me and facilitated my research in this archive throughout the term. 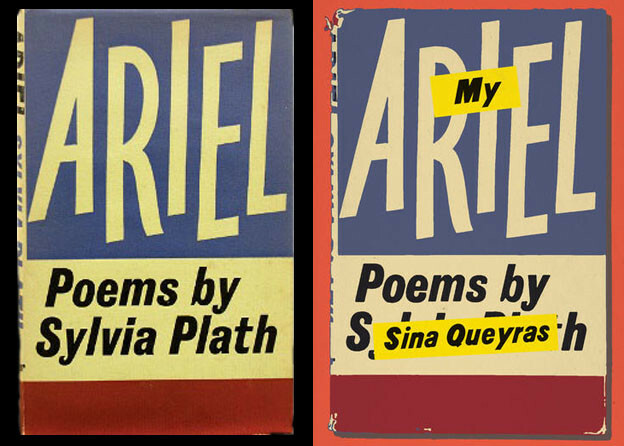 Since I am a scholar of modern and postmodern poetics, Pollack steered me toward the William Carlos Williams Research Collection — where I encountered some beautiful artifacts (including some unpublished poetry, sweet valentines, and wonderful letters from Pound to Flossie, which apart from other qualities illustrate how EP’s abbreviations are clear predecessors to SMS). The real prize for me, however, was when Pollack mentioned Penn’s acquisition of Harry Mathews’s “papers.” For many years a student and practitioner of Oulipian procedures, I knew exploring this aspect of the archive would be bountiful — and it was. The library’s cataloguing of the Mathews materials is still in its early stages. As of last fall, Mathews’s letters — stored in twenty archival boxes, containing letters from about 925 individuals, groups, or publishers — have been sorted, logged, and organized into folders by correspondent; a twenty-two-page printed index is available. During my first two sessions with the Mathews collection, I reviewed seven of these boxes, including those containing missives pertaining to my own research interests: letters by Marc Adrian, John Ashbery, John Baldessari, Charles Bernstein, Ted Berrigan, John Cage, Augusto de Campos, Henri Chopin, Robert Coover, Ray Johnson, Alex Katz, Jacqueline Kennedy, Frank O’Hara, and Locus Solus and Oulipo group correspondences and publication proofs, to name just a few. The Ashbery letters, which he signs with dozens of playful pseudonyms, are particularly colorful, and, as of yet, I can only imagine how they were stirred by equally vibrant and gaudy letters by Mathews. The de Campos folder contains some early Brazilian Concrete poetry publications (e.g., 1964 works by Azeredo, Grunewald, and Pignitari), which differ in appearance and affect from their more commonly seen and accessible book-form iterations. My interest in these letters, and Mathews’s work in general, led to a meeting with Nancy Shawcross (curator of manuscripts in the Rare Book and Manuscript Library), who gave me a tour of the behind-the-scenes holdings in mid-October, where, amidst dozens of large cartons, folders, and objets d'art (e.g., assorted sheet music, oversized creations and “ephemera” of all sorts), I noticed a small box labeled “Tapes + CDs.” As a senior editor at PennSound, almost immediately I realized the importance of finding a way to transfer, in digital form, the contents of whatever this package contained across campus — over to PennSound’s servers located at the other end of Locust Walk. 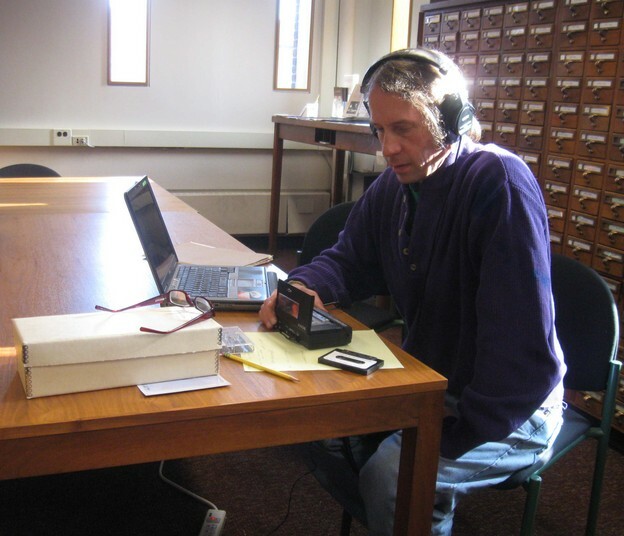 Two weeks later Mathews’s “Tapes + CDs” were dispensed to the Rare Books reading room, and the process of archive-to-archive conversion began. Another upshot from my initial meeting with Dr. Shawcross was her suggestion to make direct contact with Mathews, who she believed could help me locate materials pertaining to some specific research questions I had regarding the influence of computer technology (software or other) on Oulipian composition and process. She gave me his email address, and a few days later I struck up a correspondence: Mathews welcomed my inquiries and was willing to consider the possibility of sharing on the Web the recordings I’d found, but, reasonably, wanted to hear them before authorizing us to do so. Harry Mathews. Photo by Anna Wasilewska. Opening the coffer of Mathews’s recordings during the first of many review and work sessions, I was pleased to find a number of cassettes, a videotape, and a CD-ROM (as well as printed matter related to “Composing: Harry Mathews’ Words and Worlds,” a gallery installation of artifacts selected from the archive by Nick Montfort in 2004). The cassettes include Mathews’s 1998 appearance on KCRW’s Bookworm program (hosted by Michael Silverblatt), his February 1999 Friends of the Library reading at Penn (multiple copies), a fall 1999 reading at MIT, and Ashbery’s 1986 interview with Mathews. The CD-ROM contains Mathews family photos, and the videotape, titled “On n’attend que toi,” is a 2003 production by Daniela Franco (coincidentally a collaborator of mine at E-Poetry 2007), on which the audio features Mathews’s “Jack’s reminders to the King of Karactika” (read by Ian Monk). While I was somewhat surprised there were not more audio materials, what I found myself hearing was nothing short of brilliant. However, with the exception of the professionally produced KCRW program, sound quality on the cassettes left a lot to be desired. The Ashbery interview is particularly difficult to hear, and once I discovered that the interview had already been transcribed, published in the Review of Contemporary Fiction (vol. 7, no. 3, fall 1987) and posted online, I decided that the effort to salvage the conversation’s audibility could wait since there was plenty else to do. In early November — after reviewing, making notes on the recordings, informing other editors what I had uncovered (suggesting we find a way to add these to PennSound) — I inquired about obtaining digital copies of the cassettes. Shawcross and her assistants graciously and promptly responded, and in mid-November I picked up three CDs containing WAV files of the Bookworm, Friends of the Library, and MIT readings. Creating the MP3 files now included in PennSound’s archive, I proceeded to optimize their sonic properties, improving vocal quality and removing extraneous noise as best I could. In December, the MP3s were delivered to Mathews, who reviewed them over the winter and in March agreed to let PennSound produce an online archive based on the audio documentation of events I happened upon in the fall. Indeed, Mathews has been completely helpful during the months of labor required to bring these recordings to PennSound, for which we are tremendously grateful. In fact it was his suggestion we add to the archive some of the recordings he produced for a CD included with first issue of the journal The Sienese Shredder (2007). This addition, supported by the editors of The Sienese Shredder (Brice Brown and Trevor Winkfield), marvelously rounds out our Mathews compendium. Mathews amiably provided the WAV files for this series of poems, written over the course of his literary career, which I then converted to MP3, boosting their amplitude for better online replay and making some needed surgical repairs. Eventually someone would have transported these recordings from Penn’s library to PennSound; serendipity brought me the opportunity and privilege to tackle — and have all-around support for — this multitiered, intrainstitutional task. Seeing the procedural underpinnings, such as original sketches of Mathews’s algorithm (i.e., done in his own hand), diagrammatic poems, the foundational materials of books such as Tlooth and The Conversions, and corresponding with Mathews has been informative, to say the least. To have good reason to consume a plenitude of Mathews’s refined, inventive, creative procedures in notebooks, and to have them reverberating in ears and mind brought unanticipated stimulation and inspiration. My 2011 blog Freeholderville, which largely engages Oulipian procedures via computer algorithm, is but one of many tangible learning outcomes resulting from the experience. Hearing Mathews’s distinctive voice and meticulous reading style transports us through many worlds and cultures, introducing a range of linguistic prospects and extremities — “snowballs with irregularity” — from which everyone should benefit.